For extended dispatches on the HBS and HLS events, see postings dated October 13, 15, and 24 (two on each date; these postings include full speech texts and audiovisual recordings). Faust’s installation address appears in “Twenty-eighth, and First,” November- December 2007, page 54. 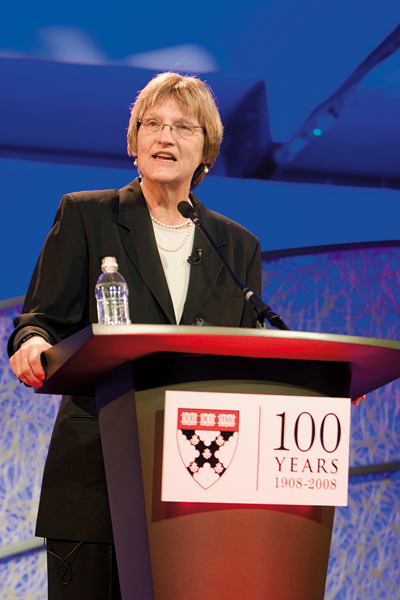 Speaking at the Harvard Business School (HBS) centennial global business summit, on October 14, and the Harvard Law School (HLS) capital campaign celebration, on October 23—amid the intensifying economic crisis—President Drew Faust outlined her vision of professional education, service, and responsibility. In concert with her installation address a year earlier, the new addresses further fleshed out Faust’s aspirations for a research university in the twenty-first century. Faust’s HBS address concerned the purposes of education for leadership—building on the school’s self-expressed mission of “educating leaders who make a difference in the world.” Dean Jay Light had already summarized steps the school is taking to meet contemporary challenges, and spelled out attributes of its focus on training leaders: through their development of judgment in establishing priorities; their entrepreneurial vision in finding opportunities to solve problems; their skill in communicating; their values and integrity; and their commitment to action. The first stonecutter is simply doing a day’s work for a day’s pay, for the material reward he receives in exchange for his labor. The substance of his work, the purpose of his work, the context of his work do not matter. The second stonecutter has higher aspirations. He wants to be the best. We know him well. Harvard does an outstanding job of producing students like the second stonecutter…. HBS…turns out graduates who command the best jobs in finance, banking, consulting, and marketing.…Now many of these graduates are to be found in the midst of this crisis—and in the midst of the efforts to resolve it. Yet somehow the vision of the second stonecutter is also incomplete. The focus on the task, the competition, the virtuosity, is a kind of blindness. Consumed with individual ambition, the second stonecutter…fails to see that there would be no stones to cut if there were not a community building a cathedral. What is the meaning of this parable for us…at Harvard and at HBS? Why and how do we strive to create stonecutters of the third sort? We have been reminded often these past few weeks about the perils of enshrining material reward as the purpose and measure of work. We know we must do better than to create a society of stonecutters like the first man. The second man is…more like much of our rhetoric and indeed commendable in many ways. That same element of service echoed strongly in Faust’s law-school remarks, delivered as celebrants gathered to toast HLS’s fortunately timed, record-setting capital campaign (precisely $476,475,707 raised, compared to a $400-million goal; 23,000 donors; 118 gifts of $1 million or more, including eight of $10 million or more). Invoking Harvard’s fifteenth president, Josiah Quincy, on the occasion of his dedication of Dane Hall as HLS’s new home, in 1832, Faust said he had “hailed the members of the legal profession for what he called their ‘noble exertions and personal sacrifices…in the interests of the age and of society.” That spirit, she said, still animated the school as it produced attorneys general, solicitors general, members of Congress, governors, and Supreme Court justices, among others. Beyond formal government service, Faust said, graduates have been involved in the whole realm of public-interest law, representing the indigent, leading nonprofit organizations, and encouraging pro bono practice within commercial law firms. Similarly, faculty members “include leaders in shaping our understanding not only of American constitutional law, but of constitutional principles in societies as diverse as South Africa and Iraq.” She cited professors’ work on economic and racial justice, on corporate governance, on human rights, and on reconciling civil liberties with security, among other fields. And she noted students’ engagement with 29 legal clinics that pursue problems in child advocacy, war crimes, human rights, and tenants’ rights.